What is a day at Pamplin Historical Park like? Click here to find out. Pamplin Historical Park and the National Museum of the Civil War Soldier provides a full day of exploring and learning about the Civil War and life in the antebellum South. The Park includes four museums, four historic buildings, live costumed interpretation, and guided tours of the Breakthrough Battlefield and Tudor Hall Plantation. Most visitors discover that they need at least four hours to truly experience everything the Park has to offer. A minimum of two hours is recommended. Admission tickets are good for two consecutive days for visitors who arrive late. The Breakthrough Trail, Headwaters Trail, and Woodlands Trail offer a combined four miles of interpreted walks. Visitors can select from a variety of hikes ranging from fifteen-minute strolls to a walk of two hours. Pamplin Historical Park serves as a trailhead for the Petersburg Battlefields Trail, a two-mile round-trip path in conjunction with the Civil War Trust and Petersburg National Battlefield. A free audio guide allows visitors to customize their own tours of Tudor Hall Plantation and the Breakthrough Battlefield. You may also download the Civil War Trust Petersburg Battle App and a map of the Breakthrough Battlefield. Recreational running, horseback riding, and biking are not permitted on Park trails. Motorized scooters available for rent at the Park are permitted on certain Park trails. Cold drinks and snacks are available at the Civil War Store in the National Museum of the Civil War Soldier and at the Battlefield Center from vending machines. 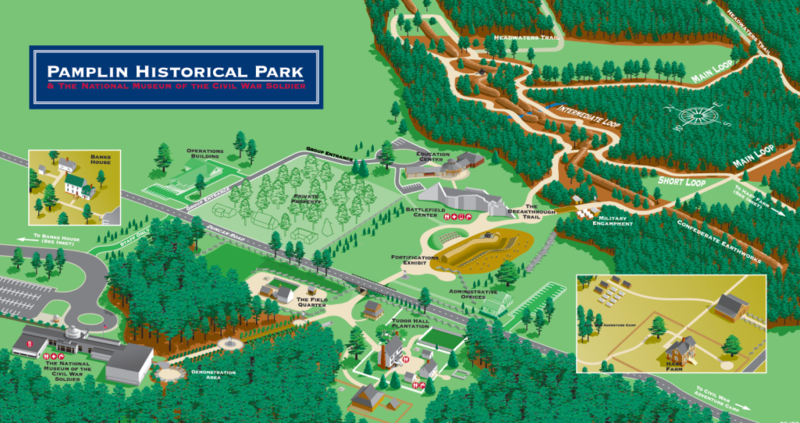 Restrooms are located at the National Museum of the Civil War Soldier, Tudor Hall Plantation, and the Battlefield Center. Picnic facilities for Park visitors are available near the National Museum of the Civil War Soldier. Lodging and camping are available within five minutes of the Park and in nearby communities. Wheelchairs and motorized scooters are available for those needing assistance with mobility. Wheelchairs may be borrowed free of charge and used both indoors and outdoors but are not suitable for battlefield trails. Scooters have a weight limit of 375 lbs., and are for outdoor use only. The cost of renting a scooter for the day is $7. Please check for availability upon admission (scooters may be reserved for up to 30 days ahead of your planned visit). Service animals are welcome.